I took this photo from the Constantia side of Table Mountain. That in the distance is the Lion's Head look-alike that you may have recalled seeing on your drive though the Hout Bay area. Hout Bay's to the left, and Llandudno's to the right - with the vast Oudekraal nature reserve in the valley below. Pretty awesome, don't you think? You can access this spot from where the Constantia Nek hiking trail starts - right where Rhodes Drive meets the circle before the descent to Hout Bay. 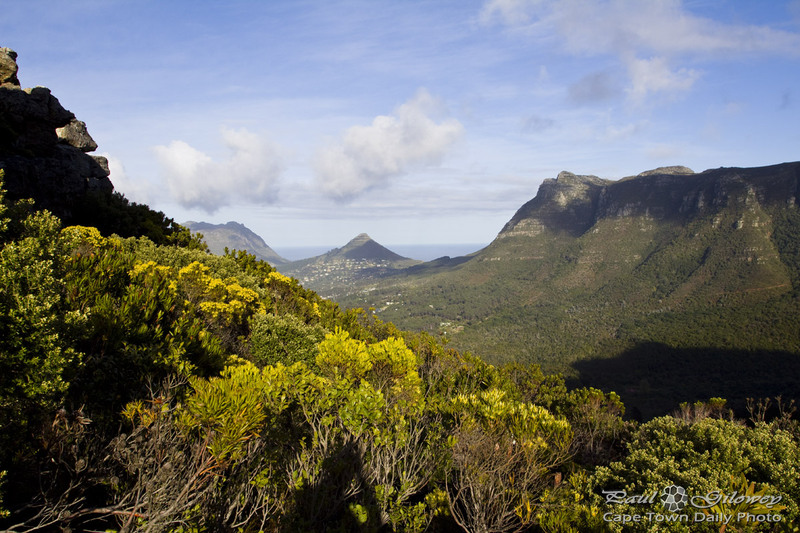 Posted in General and tagged fynbos, hills, oudekraal, table mountain on Friday, 20 September, 2013 by Paul. Thansk for the recent postings- they’re of some of my fav. places in the world. Sure thing Kerry – glad you’re enjoying them!